It’s my pleasure to visit University of Chicago again. The US general election has concluded in early November. Everyone is very concerned about the development of post-election China-US relationship. Today I would like to share with you my views on China-US relationship. This year marks the 37th anniversary of the establishment of China-US diplomatic relations. For more than 30 years, thanks to joint efforts of successive leaders and the people of both countries, China-US relations have achieved historic growth. Today, China-US cooperation is more extensive and comprehensive than ever before. I would like to make a comparison between the current China-US relations and those in 1979. In 1979, the official exchanges between the two countries were limited. In recent years, President Xi Jinping and President Obama had frequent meetings and close interactions on bilateral and multilateral occasions. From Sunnylands to Yingtai, from the Blair House to the West Lake, the two leaders exchanged views on experience in governance and built mutual trust, which has become a prominent feature of our relationship. This month, President Xi Jinping and President Obama met again on the sidelines of the 2016 APEC Economic Leaders’ Meeting in Lima, Peru, which was their 9th face-to-face meeting since June 2013. From 1979 to 2015, annual trade volume between the two countries has surged from 2.45 billion dollars to 560 billion dollars. Two-way investment which was insignificant in the early days of our relations has now exceeded 150 billion dollars. A large number of major US enterprises have been attracted by China's broad market and proactively approached Chinese consumers. As early as the 1990s, big companies in the Midwest such as McDonald, Caterpillar, United Airlines, Hyatt and Cummins have begun entering the Chinese market. Currently, exports of goods and services to China have generated nearly 1 million jobs in the US. Meanwhile, more and more Chinese enterprises have come abroad and invested in the US, bringing about 100,000 jobs to the local communities. China and US enjoy strong complementarity in our economic and trade relations and have become a community of intertwined interests. In 1979, fewer than 10,000 Chinese and Americans visited the other country. The number reached 4.75 million in 2015 and is expected to go beyond 5 million in 2016. Last week, the closing ceremony of China-US Tourism Year was held in Washington D.C. During the China-US Tourism Year, the two sides held over 100 events for tourism exchanges, which deepened mutual understanding between the two peoples and promoted people-to-people communication and cooperation between the two countries. In 2016, there are nearly 330,000 Chinese students studying in American universities, accounting for 1/3 of the total international students in the US, and the number is still increasing. China has been the largest source of foreign students in the US for seven consecutive years. The US government has also announced the One Million Strong Initiative with the aim to have 1 million American schoolchildren learn Mandarin Chinese by 2020, after finishing the 10,000 Strong Initiative which helped 10,000 US students study in China. 37 years ago, cooperation between China and the US on international and regional issues was nothing like what we have today in terms of scope and intensity. The two countries now maintain close consultation and dialogue on global challenges such as the international financial crisis, climate change, energy security and food security as well as hot-spot issues such as the Korean nuclear issue, the Iranian nuclear issue, Syria and Afghanistan, and the two countries have played an important role in addressing these. First, we should grasp the direction of the development of bilateral relationship with a strategic perspective. China and the US are not only the world's largest developing country and developed country respectively but also the top two economies. Our two countries, when combined, account for 1/3 of the world’s economic aggregate, 1/4 of the world’s population and 1/5 of total global trade. Maintaining healthy and stable development of China-US relationship plays a significant role in world peace, security, stability and prosperity. In retrospect, it was during the Republican administration that communication between China and the US started, it was during the Democratic administration that our diplomatic ties were established, which showed the two parties' strategic consensus on the importance of China-US relationship. Recently, both China and the US have been committed to economic transformation and upgrading and improvement of employment and people’s life, which lays new foundation for cooperation between the two countries. With the goal to develop itself rather than overwhelm others, China has no intention to challenge the US. It is a strategic choice that both countries should make to adhere to the principle of non-conflict, non-confrontation, mutual respect and win-win cooperation and avoid Thucydides's trap where there must be a war between a rising nation and an established one. We need to firmly reject the Cold War zero-sum game mentality, which is not only contradictory to the trend of China-US relationship in the 21st Century but also has been proved wrong. Second, we should actively conduct practical cooperation and pursue win-win results to benefit both countries and the world at large. China-US practical cooperation started from scratch, grew strongly and has become the bedrock of our bilateral relationship. The two countries have never been so inter-dependent and our interests have never been so intertwined. What happened in the past few decades has already proved that a thriving China is good for America, and a thriving America is good for China. Proceeding from the welfare of the two peoples and all the people in the world, making our comprehensive and practical cooperation deeper and stronger and pursuing win-win results and prevent double losing will benefit both countries as well as the international community. Third, we should manage our differences on sensitive issues in a constructive manner. It is almost impossible for any two countries to see eye-to-eye on everything at all times and many of the issues will not disappear overnight. However, as long as both sides can enhance communication and handle them in a constructive manner on the basis of mutual respect, we can narrow our differences step by step. It is imperative to manage our differences in a constructive and pragmatic way so that they will not derail the overall relationship. Recently I always tell American friends that this year’s US general election is getting more attention in China than in the US. That’s not only because China has a much larger population but also because with the interests of China and US intertwined as today, the future of our relationship has an impact on the daily work and life of numerous Chinese people. Many friends who care about China-US relationship have asked me that how the new US administration, after it assumes office, will impact the direction of the relationship. I would like to tell you that no matter what changes we might have both domestically or internationally, several fundamental aspects which constitute the basis for China-US relationship remain unchanged. First, little has changed that China and the US have huge common interests. From trade to investment, from military communication to people-to-people exchanges, from macroeconomic policy coordination to global economic governance, from climate change to clean energy, from disease control to disaster prevention, common interests of China and the US keep expanding in bilateral and multilateral fields. In the nine Midwestern states in my consular district, namely Minnesota, Wisconsin, Michigan, Iowa, Illinois, Indiana, Colorado, Kansas and Missouri, Chinese enterprises have invested 13 billion dollars, creating 30,000 jobs. For companies like GM, Ford and Chrysler, the big three in Michigan, China is their major market where their market share reached 13% with booming car sales. Last year, trade volume between China and the nine Midwest states reached 92.6 billion dollars, meaning quality American products are popular in the Chinese market and US consumers are enjoying good Chinese products at low prices. Some people say that trade with China has resulted in the loss of American jobs, but as Heritage Foundation pointed out in a recent study on economy and employment of the State of Missouri, trade with China did not lead to job loss. On the contrary, it created a large number of jobs and promoted US economic development, which further proves that China and the US have become a community of intertwined interests. Second, little has changed that China-US relationship brings opportunities to each other. Currently, China has set to carry out the five development concepts, namely innovative development, coordinated development, green development, opening development and sharing development, that means a huge demand for foreign products, technologies and services. The US is also actively promoting transformation and upgrade of manufacturing industry, innovation of science and technology and improvement of infrastructure. The sound economic development of both countries have provided a huge platform for cooperation. It is estimated that in the next five years, China's total imports will reach 8 trillion dollars, China’s overseas investment will reach 750 billion dollars and outbound visits by the Chinese people will exceed 700 million, which will bring more opportunities to other countries, including the US. Third, little has changed to the expectation of people in both countries for steady development of China-US relationship. During my contact with people from all circles in the Midwest, I can deeply feel their aspiration and enthusiasm for cooperation with China. Mayor Rahm Emanual said to me that cooperation between Chicago and China serves the interests of both sides. Having signed trade and investment MOU with eight Chinese cities, Chicago welcomes more Chinese investment and would like to become the gateway for Chinese enterprises to enter the US, especially the Midwestern states. Michigan Governor Rick Snyder has just concluded his sixth annual visit to China. He told me that cooperation with China is an important part of Michigan’s globalization strategy. Iowa Governor Terry Branstad said that Iowa cherishes its friendship with the Chinese people and hopes to promote bilateral partnership and win-win cooperation on the basis of mutual respect and trust. Chairman Emeritus of Chicago Mercantile Exchange Mr. Leo Melamed told me that the business community in the Midwest believes that China will be a partner of the US in the next 50 years, 100 years or even longer time. I highly appreciate their opinion. As China-US relationship continues to develop, people-to-people and cultural exchanges between China and the nine Midwestern states have walked into people’s daily life. Chicago’s Chinese New Year celebrations have become a famous brand in China-US cultural exchanges and tomorrow I will host a press conference with Chicago Deputy Mayor Zopp for the 2017 Chicago Chinese New Year programs. Meanwhile, more and more Chinese artists and art troupes are visiting the Midwest. In late September, famous pianist Lang Lang, Shanghai Jingju Theatre Company and “Listen to China” Folk Music Troup performed in various cities in the consular district and received warm welcome and high praise. At Lang Lang’s two concerts, when I saw all the audience stand up and applaud loudly for his amazing performance, I deeply felt that the Chinese and the American people both appreciate beautiful art and it is everyone’s wish that the two peoples can have more warm and friendly nights like this. 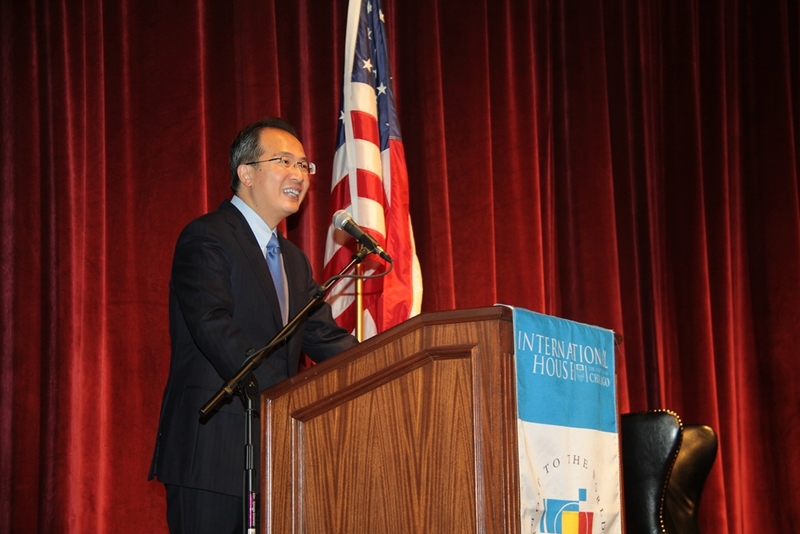 Currently there are 70,000 Chinese students in the consular district and the number of American students learning Chinese in the 19 Confucius Institutes in the Midwest is also increasing. During my visit to Minnesota, I talked with students from the local Chinese-teaching charter schools and their parents and learned that with their classes from Grade 1 to Grade 10 all taught in Chinese, these students have mastered the language very well. In the local communities there are a large number of applicants but the schools are not capable of admitting all of them. Many American parents hope their children can have jobs related to China in the future. It is now becoming a trend. Fourth, little has changed to the expectation of the international community for China and the US to play a constructive role in maintaining world peace, development and stability. Nowadays, global economy still has uncertainties and lacks strong growth momentum. Regional turbulence and hot-spots are generating greater concern and casting a shadow over regional peace and stability. They have set off a massive flow of refugees and other humanitarian issues. Global issues like cyber security, climate change and spread of infectious diseases have become serious challenges that all countries must face. China and the US are playing a significant part in international politics, economy and security. In recent years, the two countries had good cooperation on climate change and played a leading role in the adoption of the Paris Accord. China and US have also enhanced dialogue on macroeconomic policies and conducted constructive cooperation in dealing with international financial crisis, making major contribution to the world economy’s recovery and growth. Our practice shows that the two countries have built a relatively mature model of cooperation in various fields of global governance. It is the popular aspiration of the international community that China and the US can continue to play a constructive role in promoting world economic growth and handling global and regional hot-spot issues for the well-being of the world. Looking into the future, both history and reality have demonstrated that China and the US should not waiver and must stick to the direction of building up mutual trust and cooperation. Just as President Xi Jinping pointed out during his first conversation with President-elect Donald Trump on the phone, cooperation is the only correct choice for China and the US. As China-US cooperation faces important opportunities and has huge potentials, the two countries need to strengthen coordination, advance their respective economic development and global economic growth, and expand exchanges and cooperation in various fields so as to bring more benefits to the two peoples and make further progress in China-US relationship. We are very glad that President-elect Trump responded very positively to President Xi’s observation. We need to strengthen strategic mutual trust. We need to maintain frequent communication and build up strategic mutual trust in order to avoid strategic misjudgment. With sufficient mutual trust, China-US cooperation will stand on a more solid basis and enjoy even more robust growth. We need to strengthen trade and investment cooperation. The two sides need to grasp the complimentarity and win-win feature of our economic and trade relationship, seize new opportunities in each other's development, create new highlights of cooperation, expand areas of cooperation and open new prospects for our cooperation. China and the US can tap into the potential of bilateral cooperation in areas including green energy, environment protection, infrastructure building and reform of global economic governance so that our economic and trade cooperation can reach a higher level. We need to strengthen cultural and people-to-people exchanges. People represent both the foundation and source of strength for China-US relationship. We should make people-to-people exchanges a long-term mechanism. We should build up various exchange platforms and a bunch of popular brand programs to promote exchanges between our universities, media, think tanks, youth and civil groups. We need to strengthen dialogue and coordination on international and regional issues. In the Asia-Pacific region, we need to keep close coordination on our policies and work together to boost economic growth, promote integration, facilitate connectivity, and rein in hot-spot issues. At the global level, we need to coordinate macroeconomic policies and jointly push forward recovery and growth of the global economy with multilateral mechanisms such as G20, World Bank and IMF. We also need to work with other countries to deal with urgent and long-term challenges such as energy security, food security and the epidemics. As China-US relationship has entered a new and critical stage, the choice made by the two countries will have profound impact on the welfare of the two peoples and the future of the world. China would like to join hands with the US, enhance exchanges and mutual trust and strengthen dialogue and cooperation so as to ensure a smooth transition of China-US relationship into the new US administration and its sustained growth in the years to come.